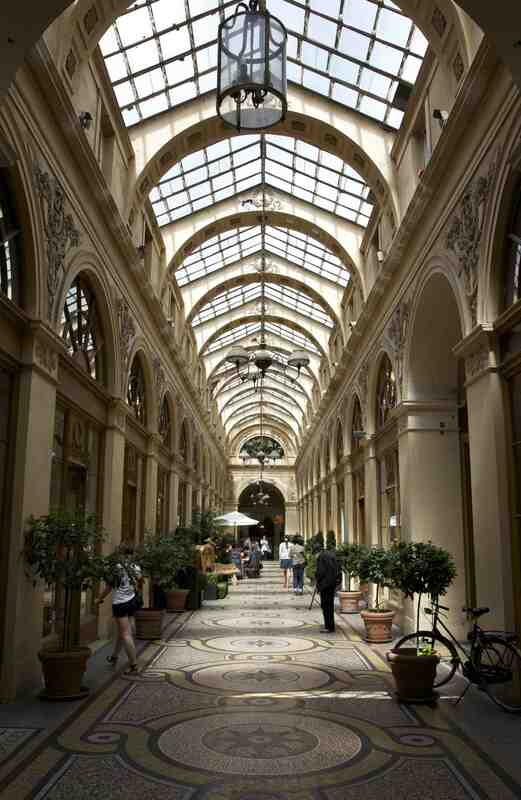 Entering any one of the seventeen surviving arcades in Paris is like stepping into an alternative world, one cut off from the noise and bustle of the metropolitan street – a space of stilled calm, filled with diffuse light filtered through the faded glass roofs above. Here, it’s possible to idle, contemplate and browse, removed as you are from the unending circulation of vehicles and onrushing people outside. 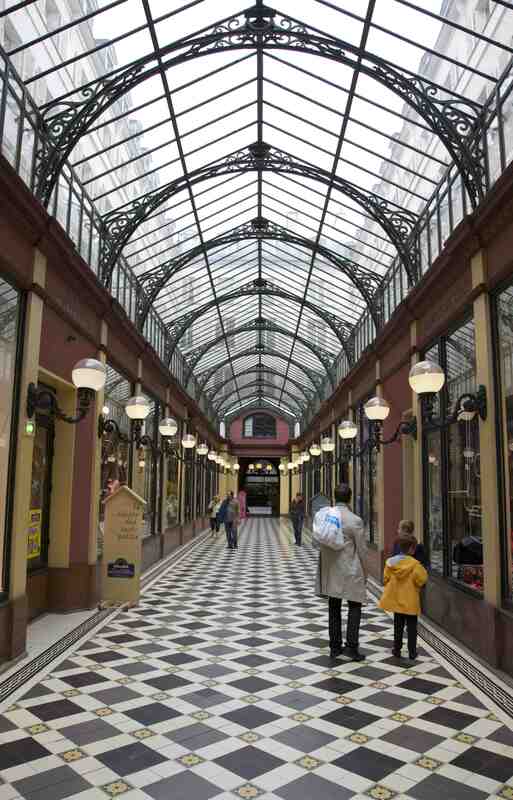 Arcades originated in Paris in the late-eighteenth century, emanating outwards (eventually to the whole world) from the Palais Royal, where, in 1786, a long wooden gallery lined with shops became the first covered passage of the modern era. Of course, any visitor outside Europe will know that the Islamic bazaar is much older – medieval in origin; yet, the first Paris arcades were different from bazaars in that they created a new physical environment for a fast-developing consumer culture. 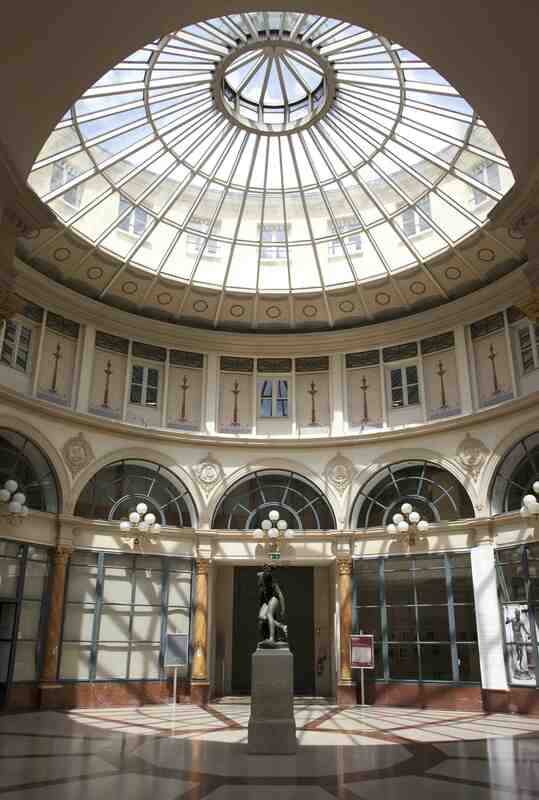 Rather than the brick and stone of Islamic bazaars, the arcades in Paris were some of the first buildings to use the new technologies of iron and glass in the construction of their roofs, as seen first in the Galerie Colbert (2; 1826) and Galerie Vivienne (1; 1827). During the nineteenth century, arcades would develop from narrow covered streets to monumental civic monuments, such as the Galleria Vittorio Emmanuele II in Milan (1865-77) or the GUM in Moscow (1888). 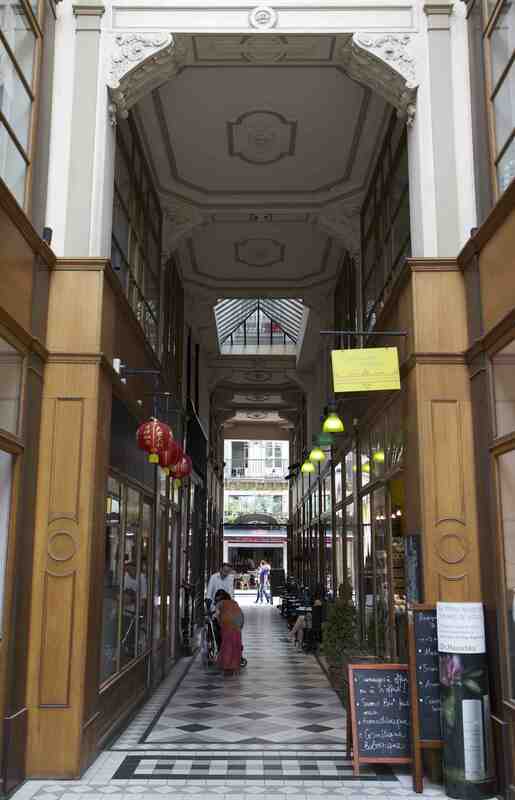 Paris’s arcades became famous largely through the writings of one man: Walter Benjamin, a Jewish-German émigre who, in the 1930s, found in these spaces a ‘world in miniature’ – that is, a microcosm of urban capitalism. By the time Benjamin began reflecting on the arcades, they had largely sunk into dereliction, being superseded in popularity by the vast department stores likes Printemps (1881) and the Galeries Lafayette (1912). During time off from poring over books in the Bibliothèque Nationale, Benjamin would wander in the nearby arcades, finding in their poetic dereliction sites ripe for the kind of ‘profane illumination’ that he believed could shatter the shiny surface of commodity culture. If he were alive today, Benjamin would no doubt be perplexed to discover that he was in large part responsible for the preservation of many of Paris’s arcades. From the 1980s onwards, and coinciding with a great flowering in the reputation and influence of Benjamin, a large number of the city’s arcades have been renovated or restored. 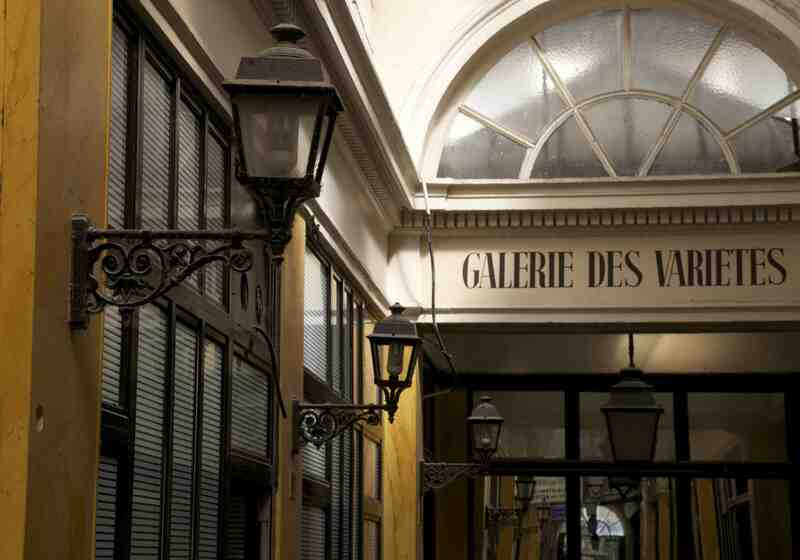 One of the most ornate – the Galerie Véro-Dodat (3; 1826) – still has its original richly-ornamented wooden shopfronts, cast-iron lamps, lyres, and genies sitting on cornucopias, chequerboard tiles, and painted ceilings; while the nearby restored Galerie Vivienne (4; 1827) has three different entrances and a sumptuous interior of mosaic flooring and other ornaments symbolising material success (laurel wreaths, sheaves of wheat and palm trees), wealth (horns of plenty), and trade (Caduceus of Mercury). 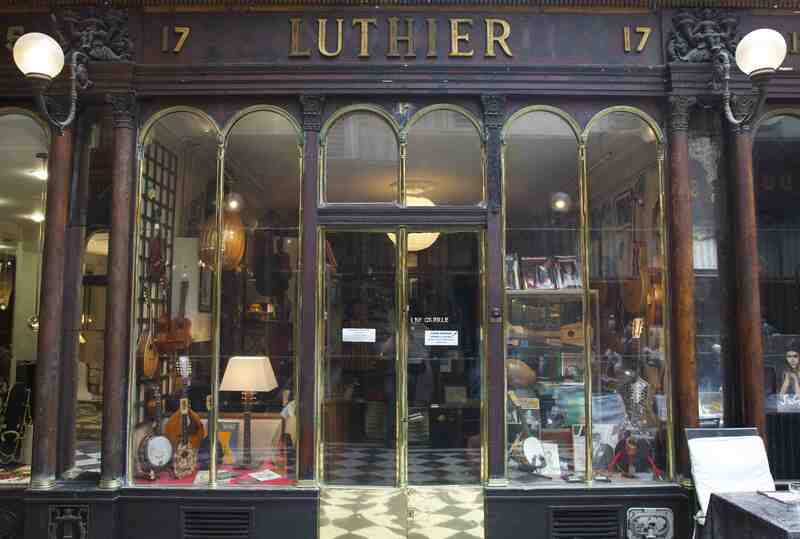 Here, some of the original shops still survive, such as the Siroux bookshop, opened in 1828, from which I bought a small guide to the Paris arcades. It might seem like Paris’s arcades have now become sites of nostalgia – museum pieces that have been cut off from the kind of historical reflection Benjamin practised in their spaces. 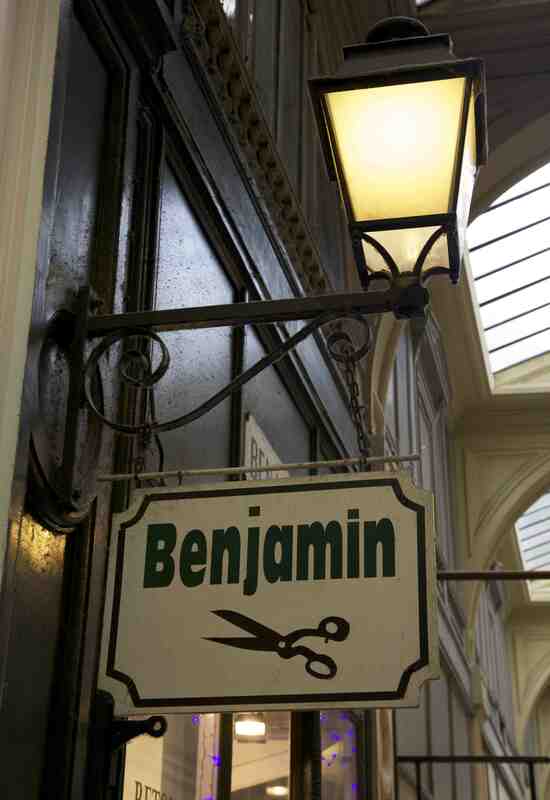 It’s as if Benjamin himself has become just one commodity amongst others, as proclaimed by a barbershop sign in the Galerie de la Madeleine (5; 1847) which takes its name from the venerated writer. Yet, in exploring all seventeen surviving arcades today, one cannot help being stunned by their atmospheric richness and distinct yet indefinable sense of localised identity. So, on the one hand, the Galerie Vivienne exudes a sense of nostalgia for the personalised luxury commodity of yesteryear; on the other, the labyrinthine Passage du Panoramas (6; 1799 & 1834) stands almost empty, its enormous mirrors making this emptiness seem all the more melancholy. 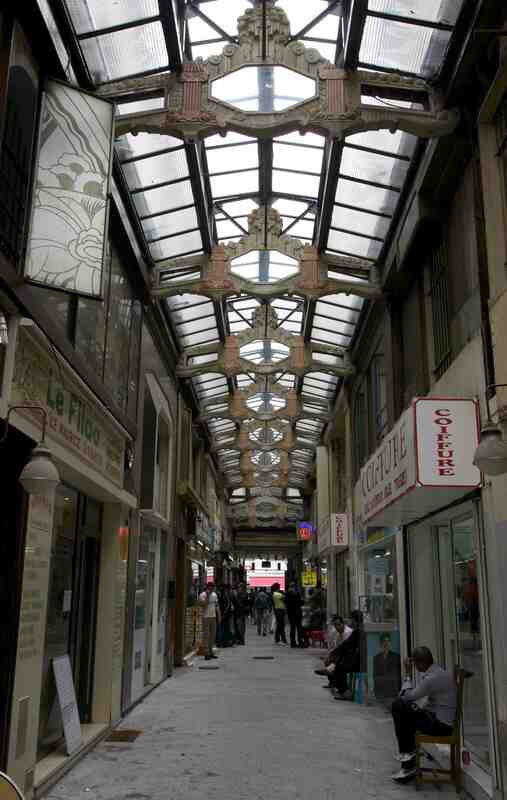 Meanwhile, the Passage des Princes (7; 1860) is immaculate, pristine and entirely filled with new toy shops, while the nearby Passage du Prado (8; 1925) is a smoke-filled haven for immigrant North-Africans, its rather severe Art Deco ironwork now framing a space more like an Islamic bazaar than a Parisian arcade. 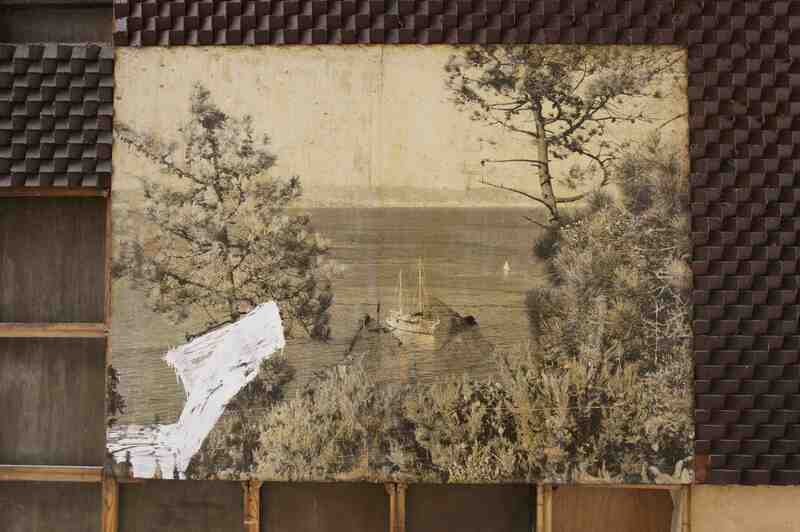 And opposite the airy, light-filled and bustling interior of the Passage du Grand-Cerf (9; 1828) is the dingy, empty Passage Bourg-l’Abbé (10; 1828), avoided by most and home to nothing but boarded-up shops, where an isolated image of a Mediterranean seascape daubed with a stroke of white paint raises many questions but answers none; a key, perhaps, to the elusive meaning of these spaces – one that must be teased out from their discarded objects. And yet the arcades have their other face. In their glass and steel design, they both reflect and inspire the utopias projected by the social visionaries of the nineteenth century, embodying the “anticipation and imaginative expression of a new world”. In that last formulation – the notion of a “new world” – Benjamin is actually quoting Marx, who used that phrase in a letter of 1866;  and this reference opens up the utopian dimension of the arcades – their other face, contrary to the face of the commodity whose contours Benjamin also found in the pages of Marx. The existence of a utopian element in Marx’s thought is evident enough, as in his critique of alienation in the early Economic and Philosophical Manuscripts of 1844 and in the famous passage of The German Ideology, co-written with Engels in 1846, which rather lyrically sketches out the communist future where “society regulates the general production and thus makes it possible for me to do one thing today and another tomorrow, to hunt in the morning, fish in the afternoon, rear cattle in the evening, criticise after dinner, just as I have a mind”. It would, however, be a mistake to limit consideration of the nineteenth century’s utopian visions to those of Marxism alone, and indeed Benjamin also gives considerable space to the very different utopian vision of Marx’s decidedly non-materialist predecessor, the French political writer Charles Fourier (1772-1837), whose dreams of a new world are placed in significant conjunction with the arcades. Fourier’s projections of the future centred round what he called the “phalanstery”, the model of a self-sufficient ideal community. Actual attempts to create such a community were made by his followers, notably in the US at Brook Farm in Massachusetts – an experiment which lasted from 1841 to 1847, and left its mark on literature in the ironic chronicle offered by Nathaniel Hawthorne in his novel of 1852 The Blithedale Romance. Great piece. Are these all your own photos? I love the tiling in some of these arcades. Thanks Owen. Yes, I took all these photos whilst in Paris in July this year. 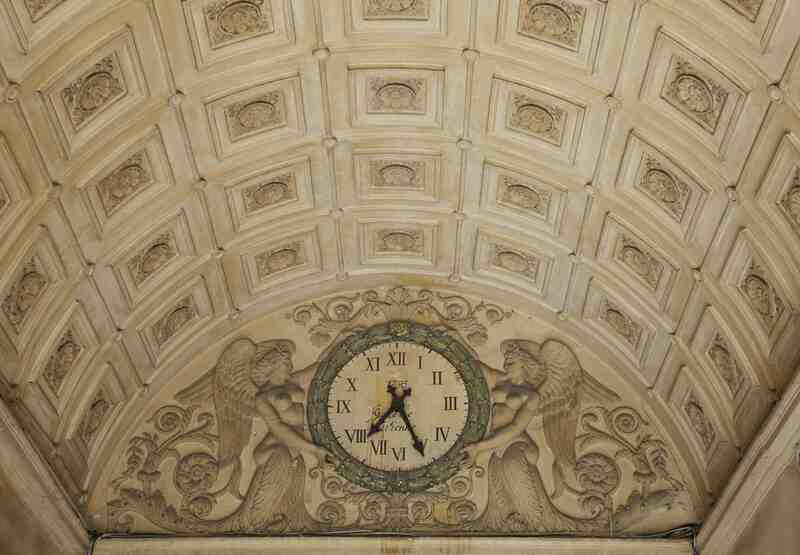 I think there are 17 surviving arcades in the city, many of which still have quite luxurious ornamentation.